A GENERATION AGO, librarians at Seattle Pacific University could direct readers to volumes that numbered in the thousands. Now, in the 21st century, SPU faculty, staff and students will soon be able to borrow from a wealth of more than 22 million books, films and other resources. Starting this summer, materials can be ordered online from the new “Orca” catalog through the Orbis Cascade Alliance, which will route the items among 26 college and university libraries in Washington and Oregon states. Two academic library consortia — Orbis and Cascade — will merge, creating the Orbis Cascade Alliance (Orca), a type of clearinghouse for higher-education resources. At this point, Orbis is made up of Washington’s SPU, Whitman College and the University of Puget Sound, as well as 17 Oregon institutions. Cascade is composed of six major public Washington universities, including the University of Washington. When the alliance is made, Seattle Pacific’s resources will skyrocket, since the six universities in Cascade offer many materials that were unavailable to the University before. If a biology professor plans to deliver a class lecture on killer whales, for example, he or she can visit the SPU Library’s Web site at www.spu.edu/library to find free resources such as books, films and audiotapes. The Library has four books about killer whales available on site and, by checking the Orbis catalog, the faculty member can borrow from among 52 other items. When the merger is complete, the Orbis Cascade Alliance will offer the professor 131 resources, minus duplicates, on killer whales. Delivery from any of the participating schools to the SPU Library should take just two to three days, versus one to two weeks through older versions of interlibrary loans. 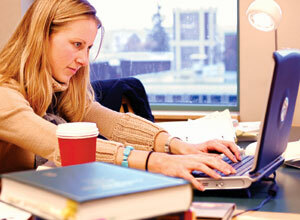 The Library will e-mail students, faculty and staff when items are ready for pickup. Cultivating hope in the face of chaos is vital today. "This is the time for a Christian university to dig down deep into its formative foundations … and decide quite clearly what bread we have to offer,” says President Philip Eaton.